Bluegrass is experiencing changes, Out in the Open, the recent release from Steep Canyon Rangers, testament to how the genre is expanding, blending rather than erasing traditions to allow breathing room and a safe ground to stand on to take chances. The North Carolina-based string band has spent two decades subtly moving the borders of Bluegrass, continuing the pattern with Out in the Open as it adds a percussive train-track beat underneath “Let Me Out of This Town” while a heartbeat is the foundation for the rhythm in “Roadside Anthems” as soft guitar strums play tag for “Going Midwest”. 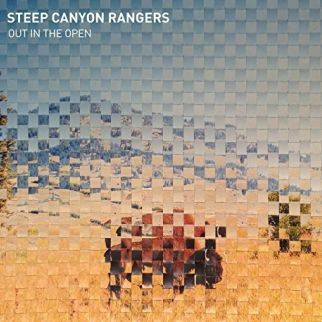 Steep Canyon Rangers are host to a sound that, along with their harmonies, puts Out in the Open on the top shelf for Bluegrass. While many genres evolve, the players in a string band all need to have a personal investment in the change, wholly relying on one another with a time-based trust for common musical goals. The strings for the band never get a chance to cool off, Steep Canyon Rangers building a solid career as well as continuing a 2009 partnering with Steve Martin for touring and recording as Steve Martin and Steep Canyon Rangers. Out in the Open is the third SCR release since the collaboration, the album recorded at Mitch Easter’s studio, Fidelitorium Recordings, in Kernersville, North Carolina with producer Joe Henry. When Steep Canyon Rangers arrived, they discovered that Joe Henry and engineer/mixer Jason Richmond had a plan to record the album with all six members in one room capturing the playing live. SCR vocalist/guitarist Woody Platt recalled that ‘we’ve recorded in a circle before but with baffles and other ways to isolate yourself. This record, if I stepped six inches to my left, I’d bump into the mandolin player. Six inches to my right, I’m bumping into the banjo player. Our microphones were all over each other, if you turned off my vocal mic, I was in twelve other ones. So really there was no way to fix anything, just like our live show’. Out in the Open relates a historical path from childhood to following The Dead in “Can’t Get Home”, lets harmony take the lead to shuffle and sashay through “Shenandoah Valley”, offers love-line advice to “Farmers and Pharaohs”, and scratches out a beat for “The Speed We’re Travelling” as Steep Canyon Rangers sway on a Country ramble through the title track and stand tall for freedom alongside Bob Dylan in a cover of his cut, “Let Me Die in My Footsteps”.